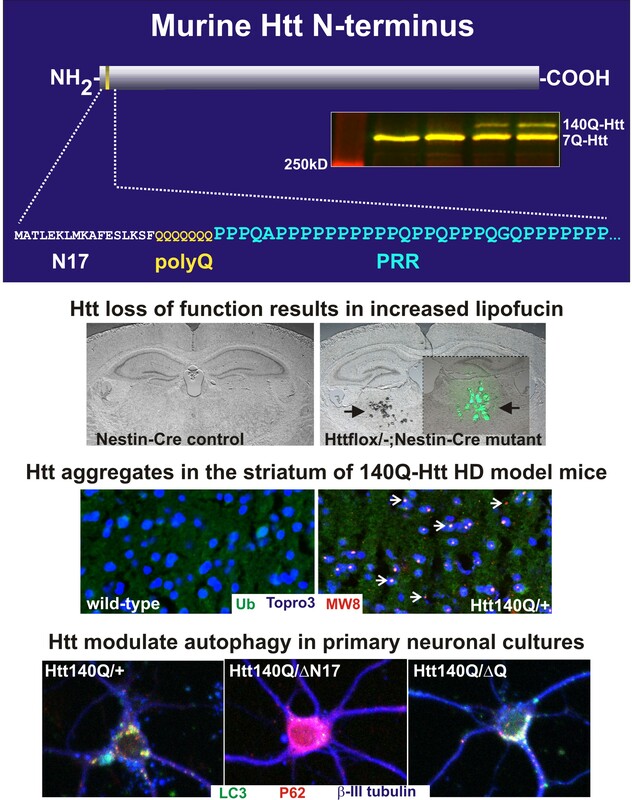 Our laboratory uses mouse models to study the normal functions of the Hungtington’s disease (HD) protein (HTT) and the pathogenic mechanisms that cause neuronal degeneration when HTT’s polyglutamine (polyQ) stretch is expanded in HD. Over the years, we have generated numerous mouse lines to study HD: (1) conditional deletion of the mouse Htt gene (Htt) and deletions of different Htt protein domains encoded by the Htt first exon, (2) humanized versions of Htt created by replacing Htt exon 1 sequence with human exon1 sequence that encodes either a normal polyQ stretch (20Q) or an expanded polyQ stretch (140Q) from a juvenile HD patient, and (3) inducible and FLAG epitope-tagged versions of humanized Htt mouse models. We are performing behavioral, neuropathological, and proteomic studies with these mice, as well as using RNAseq and primary neuronal cultures to understand Htt function and HD pathogenesis, with the hope of finding a cure for HD in the future.